Agriculture is the backbone of the Indian economy and agritourism is one of the latest concepts to revolutionize the India travel industry. Buoyed by the growing popularity of homestays in India, farmstays (essentially a homestay on a farm) are blossoming across the country. They provide an authentic and interactive experience of rural life, in the delightfully fresh country air. These farmstays are among the best in India and range from simple to sublime. Dewalokam is the organic ancestral farm of a welcoming Syrian Christian family. The name means "paradise" and the property certainly is that! This faultless farmstay is conveniently located only 90 minutes drive from Kochi airport, in the spice belt of Kerala, bounded by a tranquil river and nature reserve. Fruit, vegetables, spices, milk, and honey are all produced there. An extensive range of activities is available for guests, including spice walks, village walks, bamboo rafting, temple visits, and cow milking. Or, simply chill in a hammock! Yoga, Ayurveda, and cooking holidays are also offered. The main guesthouse has eight spacious air-conditioned rooms overlooking the river and forest. There's also a private traditional house in the forest that has three bedrooms. Rates: A standard double room costs 8,000 rupees per night, plus tax. All meals and most activities are included. Visit their website for more information. Another fabulous Kerala farmstay run by a Syrian Christian family, Vanilla County consists of a 60 year old heritage bungalow on a 150 acre organic rubber and spice plantation. It's located a bit over 2 hours drive from Kochi airport. Guests can swim in natural rock pools, go on plantation walks, go trekking, birding, visit villages and a local meditation ashram, and cruise the Kerala backwaters. Accommodations are provide in the main bungalow and in luxury Swiss tents with attached bathrooms. Rates: 7,900 rupees for a double room, per night, and 4,900 rupees for a tent. Tax and breakfast are included. Packages including all meals cost 12,000 rupees per night for a double room, and 7,900 rupees for a tent. Visit their website for more information. Maachli is a divine farmstay, situated in Parule village on the far south Konkan Coast of Maharashtra. The closest beaches are Bhogwe and Tarkarli. The name "Maachli" means "elevated huts" in the local Malvani language. The four attractive hut-style accommodations are built deep within nature amongst the Samant family's coconut, betel nut, banana and spice plantation. Everything revolves around nature, and there is a sweet water stream flowing through the property. Responsible tourism is also a strong focus. Activities include village walks, cooking lessons, farming experiences, trekking. Rates: 3,500 rupees per night, for a double including breakfast. Dwarka is a bright and modern farmstay on a 15 acre orchard, also in Maharashtra's Sindhudurg district. It's located in Sawantwadi, approximately 30 minutes drive inland from unspoilt Vengurla beach. Mangoes, coconuts, cashews, and fruit are grown there. There's also a dairy on the property. Interesting activities are offered, such as a visit to a pottery village, bamboo workshop, and mat weaving. Various local sightseeing tours are arranged as well. The traditional Malvani cuisine served using farm-fresh ingredients is a highlight. There's also a swimming pool. The farmstay has nine double guest rooms, and a family room for a minimum of six people. Rates: From 2,800 rupees per night, and packages with all meals included are offered. Visit their website for more information. Dudhsagar Plantation is located at the foothills of the Western Ghat mountains in sedate south Goa. The farm was started in 1985 and has a vast variety of organic fruit trees, spices, medicinal plants, herbs and flowers. Free range chicken and dairy farming is also carried out there. Jeep rides to remote Dudhsagar waterfall start 15 minutes from the property. To get to the bottom of the waterfall, it's a one hour drive followed by a 10 minute hike through dense terrain. The farmstay has two basic but clean and cozy cottages, both with lovely verandas, in the midst of a tropical palm garden. Rates: 2,500 rupees to 4,500 rupees per night for a double, including tax, meals, and plantation tour. Kids will love Destiny Farmstay! This resort is secluded away around 25 kilometers from the popular hill station of Ooty. It has a stable full of horses, cows, sheep, rabbits, guinea pigs and geese. And, of course, farm dogs to watch over them. A huge range of produce is grown on the farm, including coffee, spices, fruit, vegetables, herbs and flowers. For the adults, there's a luxury spa, perfect for pampering and unwinding. The farmstay has 35 guest rooms. Rates: Around 7,000 rupees upwards per night, including breakfast and tax, depending on the time of year. It's on the pricier side for the facilities offered. Also, note that the approach road is not maintained and is in poor condition. The farmstay uses its own 4WD transport to ferry guests the last couple of kilometers. Love cheese? Don't miss visiting this inspiring 22 acre farmstay dedicated to organic cheese-making and holistic, self-sustaining living. The farm has cows to provide the milk for its gourmet cheeses, and organic vegetables are grown as well. Guests can participate in a two day cheese-making course (cost 8,000 rupees plus tax). There are three guest cottages with a total of five rooms. Rates: From 3,000-4,500 rupees per night for a double, plus tax. Breakfast is included. Visit their website for more information. In Karnataka's Coorg coffee region, you'll find Green Dreams strategically nestled between rolling hills and fertile flat lands. This farmstay belongs to a local coffee connoisseur and trader, and he'll take you on an insightful plantation tour (fruit, vegetables and commercial crops such as pepper and cardamom are also grown). The property is ideal for peaceful people as there are no TVs, no smoking in the rooms, and no loud music. Instead, there are swings, hammocks, and bicycles. The five eco-friendly guest cottages are each suitable for a family of four. Rates: 5,500 rupees per night for two adults and two children under 10 years of age. This includes breakfast and dinner (only fresh, authentic vegetarian food is served). Citrus County is one of the biggest success stories where farmstays in Punjab are concerned. It's located on the way to Amritsar, and has four rooms and nine luxury tents. The farmstay been really well developed and includes a swimming pool, cafe, and bar. As its name suggests, citrus fruit is farmed there in a 70 acre orchard. Guests can go fruit picking, explore local villages, visit a dairy farm, and learn how to cook Punjabi food. Rates: 8,000-14,000 rupees per night for a double, plus tax. It includes all meals and activities. 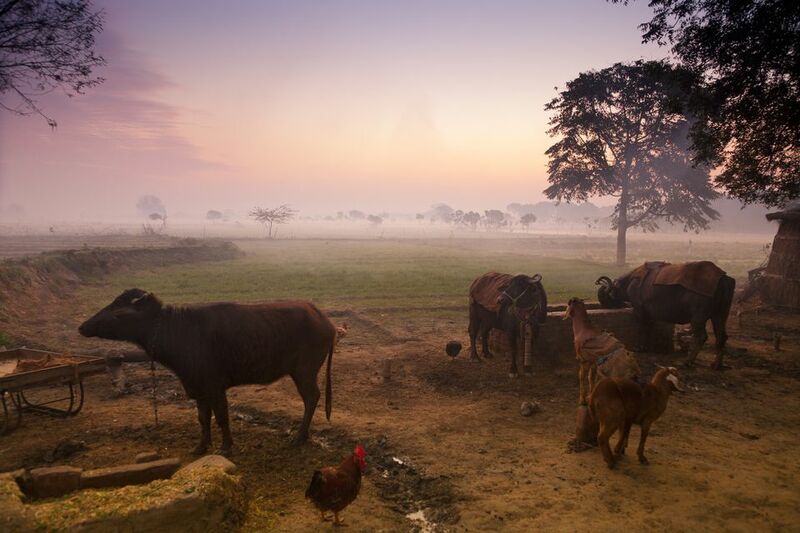 Prakriti Farms is a non-profit organic farm, located around an hour from Chandigarh, in Punjab. It has a much more rustic feel. The owners, alarmed by the surrounding disrespect for nature, are slowly recreating an ecological environment on the land inherited from their ancestors. Two types of accommodations are provided for guests -- cottages and tents. The safari tents have shared bathrooms, while the luxury Swiss tents have attached bathrooms. Rates: From 2,000 rupees per night for a safari tent. Cottages cost 5,000 rupees per night. Prices include tax but meals are extra. Prakriti Farms also accepts volunteers who want to learn and contribute to sustainable eco-farming practices. Visit their website for more information. The tantalizing Tathagata Farm offers an opportunity to get back to nature on a tea estate up in the hills, 45 minutes from Darjeeling. In addition tea, the farm grows cardamom, ginger, vegetables, oranges and other crops. Possible activities include plantation tours, trekking, nature trails and guided walks, fishing, picnicking and birding. Cottages and luxury tents with bathrooms are nestled among the greenery for guests to stay in. Rates: Around 5,400 rupees per night for a double, including tax and breakfast. As its apt name suggests, there are goats roaming around everywhere in this pristine village! Set up by Green People as an initiative to augment local income and increase markets for organically-farmed products, The Goat Village offers purpose-built cottage accommodations with private bathrooms for guests. It's essentially run as a homestay, with villagers providing hospitality and cooking delicious regional cuisine. In addition to exploring the local way of life, guests can trek to nearby Nag Tibba mountain and go camping (all arrangements are taken care of). Reaching the village requires a trek of about an hour. The closest motorable village is Pantwari, a couple of hours from Mussoorie. Do note that electricity is minimal (just enough to charge phones). Rates: 5,500 rupees per night, including breakfast and dinner. The Country Retreat is a new boutique farm stay, situated in Rajasthan's rural Pali district, halfway between Jodhpur and Udaipur. The property comprises 130 acres of farmland and the owner has vast agricultural knowledge. Popular activities on offer include bird watching, animal herding, cycling, photography, farm tours, farm activities, and complimentary Rajasthani cooking lessons. There are three air-conditioned bedrooms, attractively refurbished and decorated with regal touches. Rates: A standard double room with breakfast costs 5,500 rupees per night, plus tax. Packages, including all meals and many interesting local activities (such as participating in a village Opium ceremony if you wish), cost 7,500 rupees per night for two people. Visit their website for more information. If you want to really get off the beaten track, you'll find the rugged Banyan Tree Farmstay remotely hidden (there are no signs!) in the lush hinterland at the foothills of Western Ghat mountains in Tamil Nadu. The property is around 2 hours drive from Coimbatore city. At 4,500 acres, it's substantially sized, and even has a private waterfall and canal. Coconuts and cocoa are mainly grown there, along with some spices and fruit. The area is particularly good for bird watching. Other activities include plantation tours, nature walks, fishing, jeep safaris, cycling, tribal village visits, and cooking lessons. There are two types of guest rooms -- heritage in the main house where the hosts reside, and mountain view in a separate purpose-built wing. Rates: Expect to pay 4,500-6,000 rupees per night for a double, including meals. Read reviews here. If you want to explore traditional Kerala village-style living, 1515 Mepra is the place! This 500 year old farm is made up of a beautifully furnished heritage house, a fish farm, duck farm, gardens rich in Ayurvedic herbs, and rice, pepper, kokum, banana, and coconut plantations. The property is located in what's known as the "rice bowl region of Kerala", 45 minutes from Alleppey, an hour from Kumarakom, and a bit over 2 hours from Kochi airport. Activities include boating, fishing, village walks, temple and church visits, and Ayurvedic massages. There are four guest rooms, each connecting to the garden and accessed through the main courtyard. Rates: 3,000-5,500 rupees per night, including breakfast and tax, depending on the time of year.